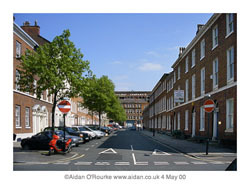 This is St John's Street, Manchester's only complete street of Georgian houses. In the 18th century these were family homes, but nowadays, most of these listed buildings house the offices of solicitors. The appearance of the street is spoilt by the no entry signs and double yellow lines, but apart from that it looks much as it did when it was first built, and will stay that way. 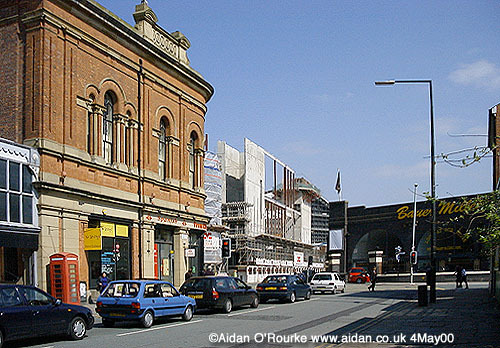 At the far end of the street is Deansgate and overlooking it, the monumental west facade of the Great Northern Railway's Goods Warehouse, in 2000 being converted into an cinema and entertainment complex. 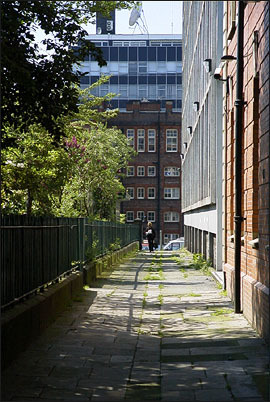 By the side of St John's Gardens is this passageway, one of the few remaining places in Manchester where you'll find original flagstones. 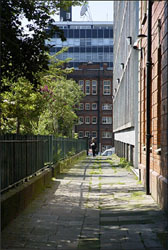 We are looking towards Granada Television, the 1958 office building is visible, with a satellite dish on the roof. In front of it is the former municipal school, built 1912, now used by Granada Sky Broadcasting. 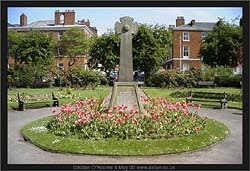 In the middle of St John's Gardens is a memorial to the church which once stood here, and to the people buried in the churchyard. The inscription states: "St John's Church, which was taken down in 1931, was built on this site by Edward Byrom in 1769. Around lie the remains of more than 22000 people." 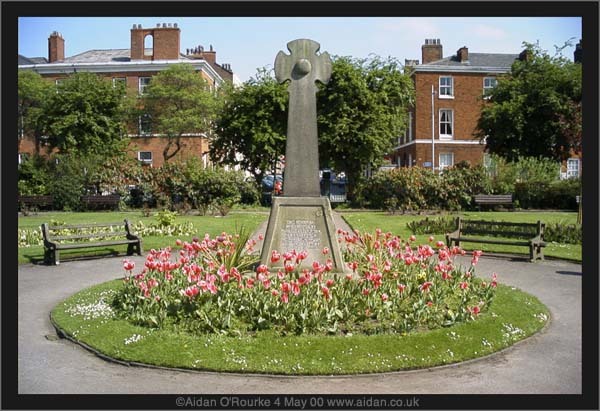 This is a quiet and pleasant corner of the city centre, and can't be built on as this is consecrated ground. This unusual edifice on the corner of Deansgate and Great Bridgewater Street is all that's left of the old Great Northern Goods Warehouse railway viaduct. The bridges to the left and the right were removed after the warehouse was closed in the 1970's. Prestige auto dealer Bauer Millett currently occupies the arches. Maybe this amputated structure ought to remain as a monument to transport, but this is not to be. A new Hilton hotel is to be constructed here, one of a large number of new hotels being opened in time for the Commonwealth Games. 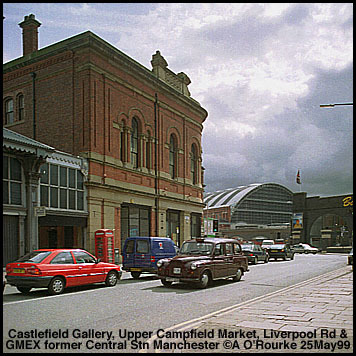 We are standing on the corner of Liverpool Road - the old railway arches are visible on the right, and in the centre we can see construction work in progress, obscuring the view towards GMEX, the former Central Station. When finished, this will be the southern entrance of the Great Northern Experience, a cinema and entertainment complex due to open in late 2000. Compare this view taken in 1999 (right), and again in 2001. Many of Manchester's railway arches have been converted for use as workshops, restaurants, and even a theatre - The Green Room on Whitworth St. Here, developers Westport have overcome the problem of access to the street by building boardwalk-style balconies and footbridges above the canal. Night clubs, cafes and shops will occupy the arches, which support part of the GMEX complex, formerly Central Station. In the distance we can see the tower of the Palace Hotel, former Refuge Building, and on the right is the former Hacienda building, adorned with banners left by anarchist protesters. 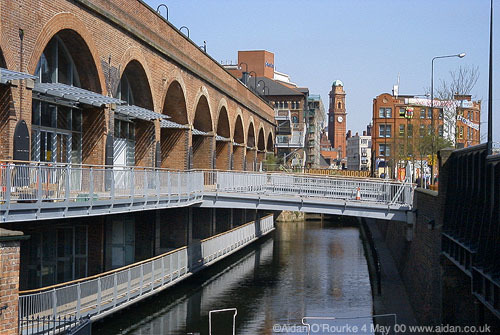 The Deansgate Locks development opens at the end of May 2000. 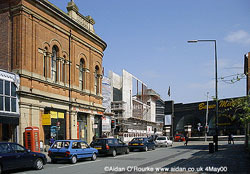 This is Chester Road, leading south west out of Manchester city centre along by the historic district of Castlefield. On the former canal basin at Knott Mill, developers Crosby Homes are constructing a very large block of prestige apartments. It has already started to dominate the east side of Chester Road and Castlefield, to the left. The developers have provided a computer-generated image of how the buildling will look when complete. It's impressive, but is it too big for its surroundings? MANCHESTER IS CHANGING, and not always for the better. Much of the historic character of the city is being swept aside by development, which nevertheless brings new jobs and opportunities into a city with many economic problems. Let's hope the boom is sustainable, and that Manchester can develop into a better city whilst maintaining its unique heritage. 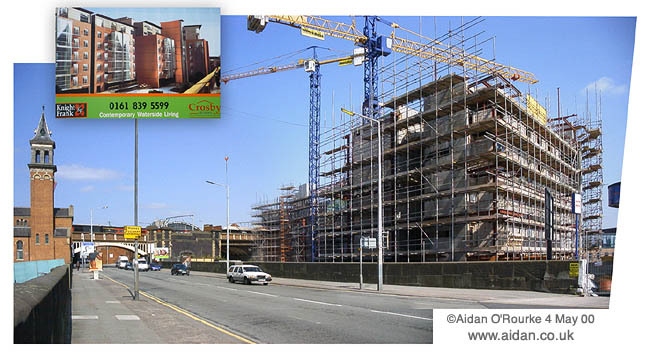 This is just a small selection of construction projects in progress during Spring 2000. More buildings under construction in other parts of the city centre will be featured here soon.